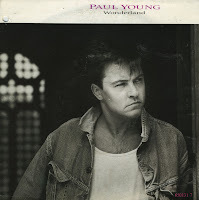 'Wonderland' was the first single taken from Paul Young's third solo album 'Between two fires'. The song was written by Betsy Cook, who would record the track herself a few years later. That single has been in my collection for years now, so I decided to add this cover version as well. Paul Young's version of 'Wonderland' reached number 24 in the UK singles chart and number 12 in the Dutch Top 40.